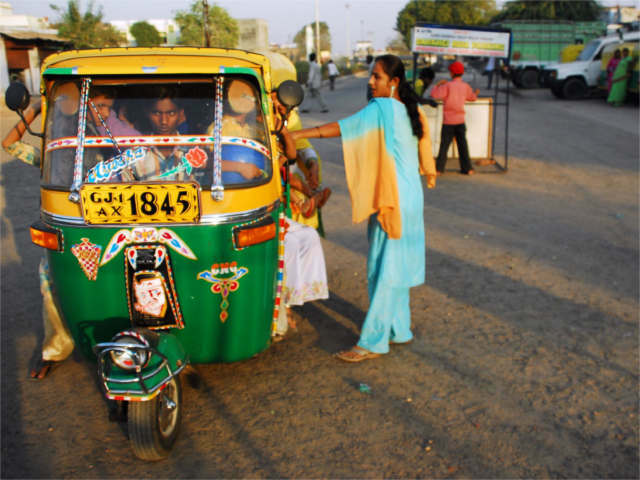 An auto-rickshaw transports passengers in Gujarat, India. Photo by lecercle. Recently, the State Government of Maharashtra (the third largest state in India, located on the western side of the country, and home to the cities of Mumbai, Pune and Nagpur) began looking into a proposal to run long-distance, point-to-point shared taxi services to improve the quality of daily commutes in Mumbai. The service is seen as a potential solution to overcome the crippling congestion and reduce the alarming air pollution trends that increased motorization has brought to Mumbai’s streets. Sharing daily commutes is being touted as a viable alternative to single-occupancy (or chauffeured) drive-to-work for many Mumbaikars. It’s success, though, might reside in it being offered as a quality service, as opposed to merely a transport solution. Ridesharing has become popular the world over, and in Mumbai and other Indian cities, shared auto-rickshaws and taxis are common feeder services to suburban railway stations, central business districts, and tourist locations. Such services depend greatly on strong and regular demand for taxis or auto-rickshaws and have traditionally operated out of assigned shared-taxi/rickshaw stands. A central feature of the shared services is that they ferry commuters only for short distances, with the fare split equally between the number of commuters (for auto-rickshaw, usually 3, and for taxi, 4). In comparison, the proposed shared-taxi service will aim to cover long distances, ferrying commuters from major residential areas to dense central business districts in Mumbai (Bandra-Kurla Complex, SEEPZ and Lower Parel to name a few). Currently, there are a few innovative services that facilitate ridesharing in Indian cities – most of them provide technological tools to facilitate the development of ridesharing networks, rather than the building of a specialized fleet of shared taxis. For example, SmartMumbaikar is a technology-based startup that enables social connections between registered users having similar commute patterns (origin-destination points, time of commute). Other services like SharedCab, Zinghopper, and Khali Seat offer ridesharing with Facebook-verified user accounts, to help assuage safety concerns of sharing rides with strangers. SharedCab, based in Mumbai, makes use of air-conditioned fleet taxis to offer a comfortable and high-quality service to those willing to share rides, whereas the other services encourage commuters to make their own taxi sharing arrangements. In Mumbai, regulations relating to operating shared transport services range from ambiguous, and thus open to interpretation, to strict prohibitive of shared-taxis operating as regular for-hire taxis during off-peak hours. One of the key challenges to scaling up point-to-point, shared-taxi services in Mumbai comes in the form of delineating regulatory barriers and consistency. Another key challenge cited during EMBARQ India’s consultations with entrepreneurs was the uncertainty in organizing demand for the service. There is little assurance that a waiting shared-taxi will collect 4 passengers all at once; often the passengers will have to wait, and their schedules or willingness to wait may not allow it, thereby affecting the demand for the service. An efficient way of managing demand and making supply of shared taxis available will be crucial to the feasibility of such a service. Success in managing supply and demand creates key demand areas for such a service among new audiences, such as corporate employers that have major offices in Mumbai central business districts. These firms have a large number of employees traveling from different parts of the city to their offices, and some even offer fixed or variable travel allowances, depending on the mode of travel. For example, some companies will offer allowances for parking and fuel for private vehicles, whereas others will provide reimbursements for travel by the local train or bus service. Employers play a key role in travel choice – depending on the incentives provided to their employees, they can encourage ridesharing or taking public transport to work, by simply discontinuing travel allowances for private vehicles. Furthermore, by connecting with ridesharing services, they can ensure an efficient and timely commute for their employees, possibly even helping to save the environment from harmful excessive emissions from increased motorization. Corporate employers who have similar potential to alter their employees’ travel patterns, potentially helping worker productivity as well. Taking this stakeholder dynamic into consideration will be important to the successful implementation of long-distance ridesharing as a commuter option in Mumbai. After all, a happy employee is one that travels to work comfortably!